Designing an open plan kitchen, living space and diner? Be inspired by this kitchen makeover – and check out all our kitchen transformations to get ideas for your new room. The rear of the house left a lot to be desired, however, with a small, outdated 1980s kitchen, a dark breakfast room with no view of the garden, and a living room with old French doors to the patio. ‘We bought the house from an elderly couple who had lived here for more than 25 years and had done little to modernise it,’ says Lindsey. ‘We didn’t want lots of small rooms as we’re a sociable family and like to spend time together. We were used to an open-plan basement with a kitchen/dining/living space in our old house and wanted to re-create that feel here — only this time, with an amazing view to enjoy. Knocking down the internal walls that separated these three rooms, along with building onto the existing patio, provided the large, open-plan space that Lindsey and Chris wanted. 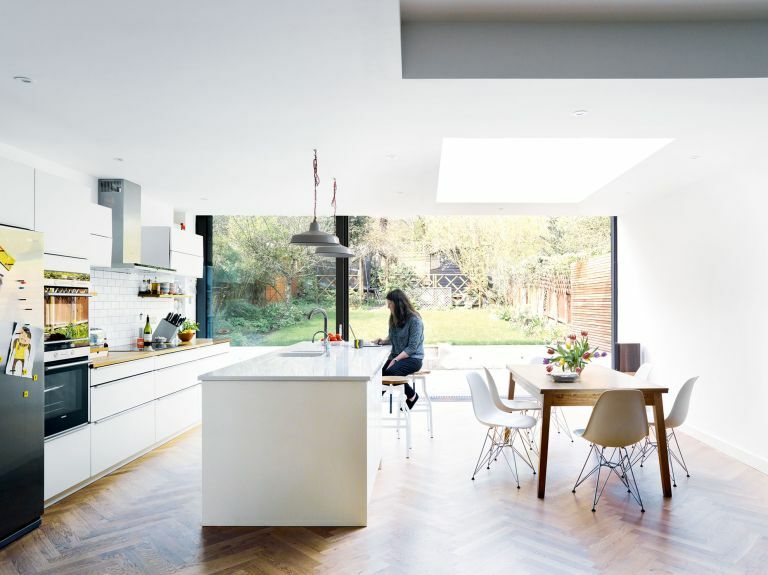 A rooflight introduces as much light into the room as possible. The couple also added a loo and utility cupboard. The new kitchen is a simple modern design with white matt doors and discreet pull handles. Warm wooden worktops and shelves prevent the scheme from looking clinical. A central kitchen island houses the sink, with a boiling water tap, and a breakfast bar on the opposite side, which allows the couple to chat to guests while preparing food. The island is topped with a durable composite work surface, which has practical drainage grooves. The finished space has changed the way the family use the whole house. ‘We love it, and as we have a lot of our old furniture in here, it felt like home instantly. There is nothing we would change,’ says Lindsey. ‘The light is amazing early in the morning, when the sun catches the trees.